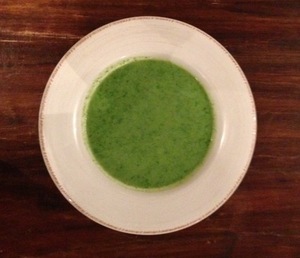 The secret to my Green Soup is to add the spinach right at the end and just let it blanch then blend it up when it has wilted, this keeps it super GREEN. Fry the Onions with some olive oil in a big pot, add the mixed herbs and let them sweat together for a few minutes, add your leeks and celery and continue cooking, add more olive oil if required. Add the Zucchini, Cauliflower and any other seasonal green/white veggies you want, if adding silver beet or chard, add them nearer the end, so you don't over cook them. If you want to add garlic, add it now, no more than a few cloves. When all veg has had a 5 minute fry off, add some hot water gradually, cover all the veggies and let them simmer, add stock cubes and cover for 20 mins. Add the spinach at the very end when hob is off put lid on and leave for a few minutes, until wilted. Use a hand blender or a food processor, whatever you have and blend it all up until smooth and no lumps. Put back on heat for 10 minutes, add couple of good pinches of salt. Eat then there or leave to cool and store it for the week, I also freeze some of mine for the following week. Perfect to bring to work for lunch, just reheat and enjoy.